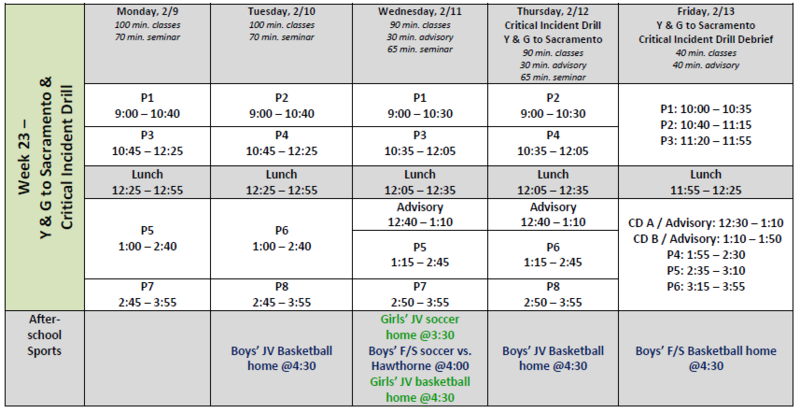 Here’s next week’s schedule! A reminder that there is no school on Friday, March 6th, and there is a Spring Dance on Thursday, March 5th from 7 – 10pm at the Hawthorne Memorial Center. Tickets are $15 each and can be purchased during lunch all next week! 9th Grade Spring Family College Meeting signup is open! Dear Parents of 9th grade students: it is time to sign up for your spring family college meeting! Erin and/or I will facilitate these with you and your child, and the topics will include a review of students’ transcripts & the 4-year graduation plan, an overview of the different types of colleges and degrees offered, information about careers & earnings associated with different degrees, and summer college prep opportunities. We hope to have every family attend, so please email or message me if none of the time slots in this signup work for you! Next week is National Engineering Week and a regular schedule for DVS, with a student-staff soccer game at the DV Design field on Wednesday after school! This is the last week of the Da Vinci Annual Giving Campaign! Please join Da Vinci families and staff in pledging their support to Da Vinci Schools- a $50,000 matching challenge is being sponsored by Chevron, Belkin, Northrop Grumman, DIRECTV and Gensler. This generous corporate sponsorship means any amount you contribute will be doubled! For more information or to make a gift online, visit http://www.davincischools.org/makeagift.shtml . Please donate or pledge by February 28th to help us take advantage of the matching program. All pledge payments must be received by June 1, 2015 to be eligible for the match. We thank you! Thank you in advance for your generous support and appreciation of our teachers! I hope your family enjoys this 3-day weekend, and I also encourage you to talk with your kids about the critical incident drill we ran yesterday and the debrief of the drill we did today. Your kids did a phenomenal job and I am very, very proud of how seriously they took the drill. I also encourage you to have a conversation this weekend about your own family’s emergency plan, such as where you would meet if you couldn’t get to your home and couldn’t call each other. Here’s your week 24 schedule…See you on Tuesday! Dear DVS Families: Tomorrow, Thursday, February 12th, we have planned a critical incident exercise in conjunction with the Hawthorne Police Department. The purpose of this exercise is to help students think through the ways they can protect themselves and each other in case of an intruder on campus. We have designed the exercise such that there will not be any actual use of weapons, and the goal is to minimize students’ anxiety while raising their awareness and preparation for this type of situation. If you have any questions or concerns, please contact me at swallis@davincischools.org. 10th grade family college counseling meetings begin this week! Our college counselors will be going over your child’s transcript, PSAT results, SAT/ACT prep timeline, and summer opportunities. Click here to choose your time slot! Sign-ups are here for 10th Grade Family College Meetings! Families of 10th grade students, it’s time to sign up for your spring family college planning meeting! This is a big one – our college counselors will be going over you child’s transcript, PSAT results, SAT/ACT prep timeline, and summer opportunities. Click here to choose your time slot! Here’s your week 22 schedule! Friday is a professional development day (no classes for students).